MOBILE, Ala. – After wrapping up the fall portion of its 2018-19 schedule with its best 54-hole performance of the season, the Louisiana Ragin’ Cajuns golf team officially tees off the spring portion on Monday when it opens play at the Mobile Sports Authority Intercollegiate at the Magnolia Grove Crossings Golf Course. Play on the par-72, 7,212-yard course will start at 8 a.m., with a 36-hole shotgun start. The final 18 holes is set for an 8 a.m. shotgun start on Tuesday. Live results will be available at RaginCajuns.com. Louisiana, coming off a season-low score of 853 at the Warrior Princeville Makai Invitational last October, is part of a 15-team field that includes host South Alabama plus Sun Belt Conference opponent Texas State. Rounding out the field includes Abilene Christian, defending champion Florida State, Illinois State, Jacksonville State, Kennesaw State, Louisville, Nicholls, North Alabama, Oral Roberts, Richmond, Southern Miss and Western Kentucky. Louisiana will be pair in the opening two rounds with Illinois State, Jacksonville State and WKU. Charlie Flynn, who recorded a 73.43 stroke average in 14 rounds of play during the fall, will lead Louisiana into its spring opener. The freshman earned a pair of top-25 performances during the fall season, capped by a 24th-place finish at the Warrior Princeville Makai Invitational, while recording six rounds of par or better. 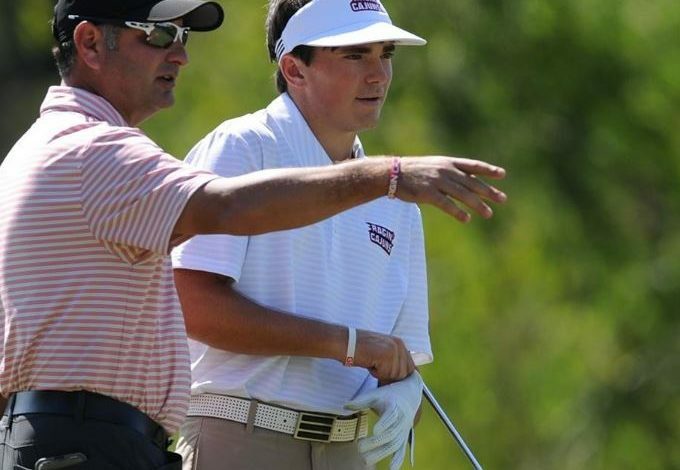 Micah Goulas who finished 10th overall in his lone appearance in the fall at the David Toms Intercollegiate, will make his spring debut for the Ragin’ Cajuns with Jack Tolson (73.91), Peter Hinnant (73.45) and Bjorn Gudjonsson (75.13) rounding out Louisiana’s five-man lineup. The spring season-opener is the first of seven events for Louisiana heading into the Sun Belt Conference Championships, scheduled for April 21-24 in Miramar Beach, Fla. The Ragin’ Cajuns will compete at the All-American Intercollegiate in Houston, Texas on Feb. 17-19 before hosting the 34th annual Louisiana Classics, Feb. 25-26, at Oakbourne Country Club.